This article gives you complete information about Rohit Sharma - young and talented cricketer of India. More details about the biography, profile and career performance of Rohit Sharma is quoted in this article. Read the article full for complete details. The full name of Rohit Sharma is Rohit Gurunath Sharma who was born in the year 1987 April 30 at Nagpur, Maharashtra, India. Rohit Sharma made his one day debut in the year 2007 June 23 against Ireland and his t20 Debut was against England in the year 2007 September 17. 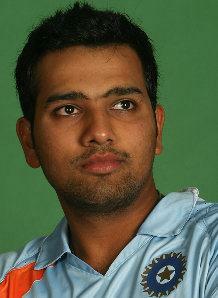 Rohit Sharma is a future cricketer for India. He is a young and talented player in India who is expert in playing pull shots. Rohit is a right handed middle order bats man and a right handed off break bowler for India. Rohit Sharma showed his brilliance in IPL cricket where he was one of the top scorer in 2008 IPl season with 404 runs. Currently Sharma is a player in Mumbai Indians IPL team. His first class career is also successful. When he was dropped from India team in 2009, he showed a brilliant performance in Ranji trophy where he scored a triple century and come back again to Indian team. Currently Rohit sharma is not playing due to Injuries. More details about the profile and career performance of Rohit sharma is given below.